For what it is worth, in Brazil we used to get through huge numbers of bananas feeding the tanagers, so as an experiment we put a banana out to see if anything would eat it. 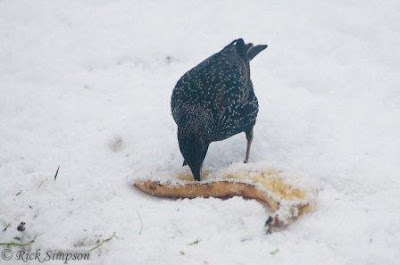 Predictably I suppose a Starling was the first to try it and took great chunks out of it with gusto but soon lost interest. 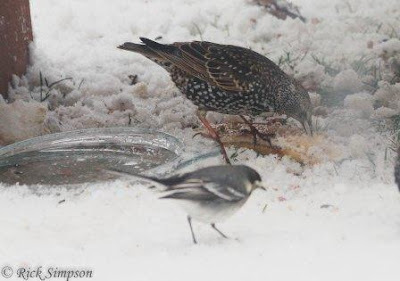 (and the Pied Wagtail that didn't). 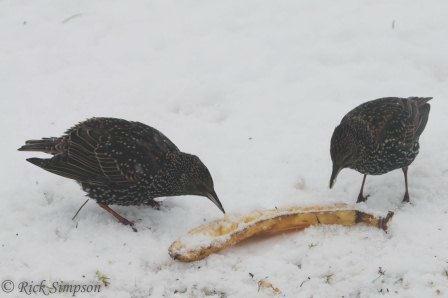 Shortly after several Starlings were seen setting about the banana we put out the front. Not quite tanagers but pretty enough birds in my view. Later, as the evening was drawing in, a Blackbird helped herself. 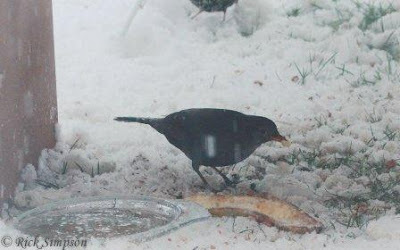 Female Blackbird helping herself to the banana. The problem is, bananas are not as cheap as they are in Brazil! They are unlikely to become regular items in the menu for our birds I'm afraid they have to make do with apples. Blast from the past. Rufous-tailed Jacamar. More blackbirds than you can bake in a pie! More snow and more excitement in the garden.